We, humans, are equipped with bones that help us to structure our body without wasting energy. Because when we are standing still or walking, the bones are structuring and providing rigidity to our body. If we don’t have bones in our body, then the body has to structure itself with muscles – wasting a lot of energy. Let’s learn how these bones are connected together ether to form the skeletal system. Bones in the body of humans are connected together to form a system of bones called the skeletal system. The main job of the skeletal system is to provide a rigid structure on which whole of our body holds. There are various functions to the bones other than providing rigidity. Some of these functions are providing protection to the soft and delicate organs, such as the heart, lungs, and brain. The brain is protected in the cranium of the skull, whereas the heart and lungs are protected in the rib cage. 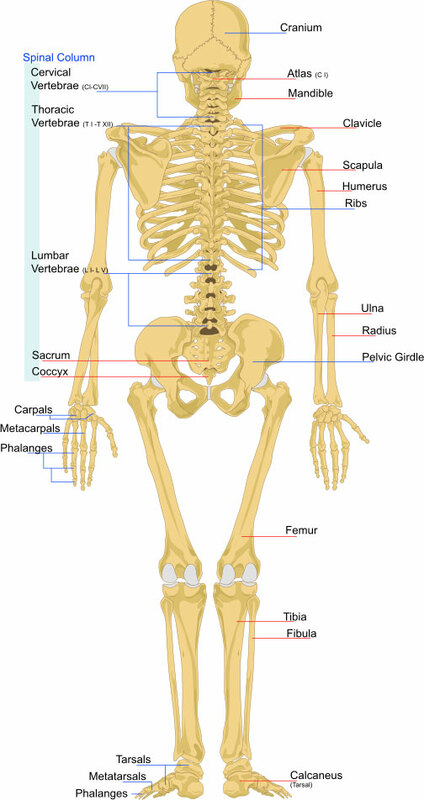 There are around 206 bones in the skeleton of the human body. These bones are connected together and with muscles of the body to perform movements. Bones are connected with other bones with tissues called ligaments. The muscles are connected with bones with another tissue called tendon. Bones of the human body are mostly composed of minerals of calcium and water. On average, the bones contains 31% water and are mostly made of non-living tissue materials. There are various layers of a bone, which are outer layers, inner layer, and center. The outer layer of the bone, called cortical bone, is very hard and smooth. But, the inner layer is porous which make the bones lightweight while retaining its strength to an optimal level. Moreover, the center part of a bone is filled with marrow which is a soft substance. Our bone contains two kinds of marrows; red marrow and yellow marrow. The red marrow of a bone is responsible for the production of red blood cells and white blood cells. Whereas, yellow marrow is majorly made of fat cells. When bones are connected together, they form a joint at the place of their connection – such as knees and elbows. Joints allow bones to move with respect to each other while maintaining the rigidity. Our body contains about 360 joints which give us a degree of freedom. There are 3 types of joints in a human body according to the degree of movement; fibrous joints, cartilaginous joints, and synovial joints. Fibrous joints – They are immovable and they only allow bones to connect with each other. For example, joints between teeth and jaw. Cartilaginous joints – These joints connect the bones with cartilages and leaves no open space in the joints. Cartilaginous joints have a partial degree of movement during childhood, but as the child reaches adulthood, these joints have very little freedom to move. Synovial joints – These joints are very common in the human body which gives large freedom of movement to the bones. 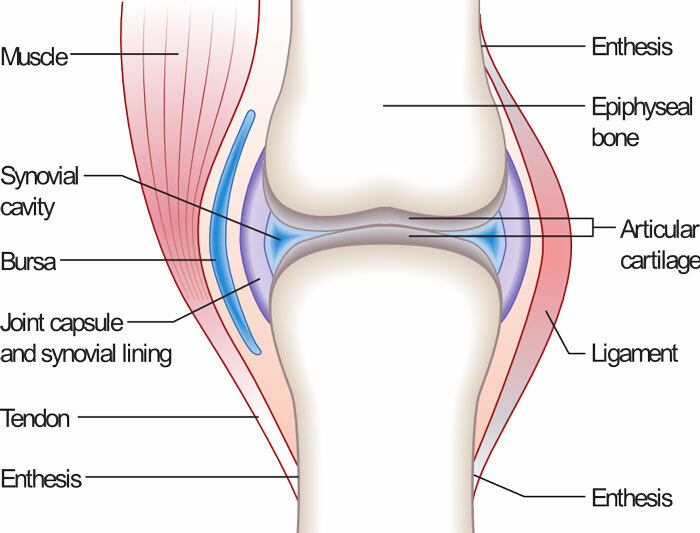 For example, knees, elbows, and finger joints are synovial joints. So, how a bone heals when it is broken due to an injury? Since bones in our body are harder and they don’t heal like injured muscle or skin. The healing process of bones takes months during which period it can’t take the pressure that a normal bone can take. When a bone is broken, it is first surrounded with blood which forms a kind of rough layer over the broken part. After a rough layer, collagens – a kind of tissue – will start to form in the broken part of the bone. Collagen and cartilage – flexible than bone tissue – together will fill the gaps in the broken bone. The filled gap will slowly and gradually transform into hardened bone over time. On average, the bone marrow produces 5 billion red blood cells each day in the body of an adult person. Synovial joints in our body contain a very slippery fluid, called synovia, which reduces the friction in the bones. When the human body lacks in calcium minerals, it can directly take calcium from the bones which make the bones weak. Abdul Wahab, "Skeletal System," in Science4Fun, April 12, 2019, http://science4fun.info/skeletal-system/.